Feni, Aug 20 (Just News) : At least six people were killed and seven others injured after a cattle-laden truck collided with a microbus in Chhagalnaiya of Feni early Monday. 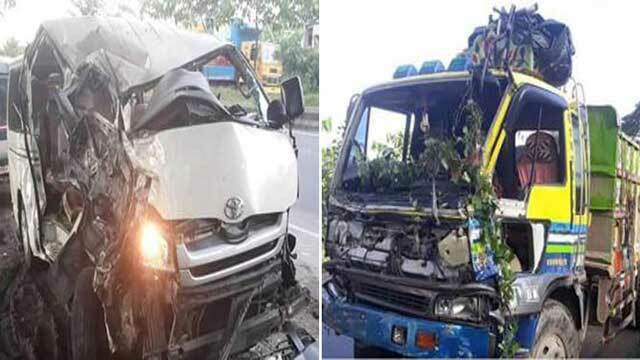 The accident took place on Dhaka-Chattogram highway in front of Sultana Patrol Pump in Muhuriganj of Chhagalnaiya upazila around 3:00am when the Chattogram-bound cattle-laden truck had a collision with the Chhagalnaiya-bound microbus while taking a U-turn, said police. The identity of the deceased could not be known immediately. Of them, two were children and three women. On-duty sub-inspector of Muhuriganj highway police outpost, Mahabubur Rahman, told that the injured were undergoing treatment at Feni Sadar Hospital.